CHEERS! This past week has given me many reasons to raise my glass, and I can think of no liquid I’d rather have in it right now than today’s feature: my skinny APPLE CIDER SPARKLER cocktail. 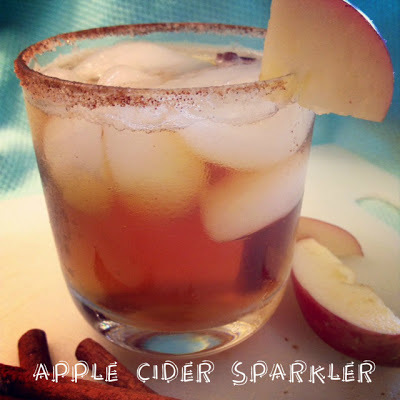 This skinny APPLE CIDER SPARKLER cocktail is gingery, cidery, appley, autumn nectar. With a mix of fall flavors, it is crisp, bubbly, and packed with seasonal tastes that I love. 1. My Minneapolis friends Megan and Cam were married Saturday! I’m not sure what it says about me that the single image I captured was of the cake. 2. Ben has a job! After weeks of non-stop travel around the upper Midwest for interviews, Ben has accepted an internship offer with a Wisconsin firm about which he’s truly excited. We had the pleasure of celebrating over dinner with a few of the firm’s lawyers and their spouses last night. The meal and company were lovely, and I feel like I have a better picture of where Ben will be next summer and (fingers crossed) for the long term. I probably just alienated half of my audience (and maybe jinxed the Irish), but I’m going to revel while I can. We finally have a chance at a BCS bowl, and I’m torn between unadulterated exaltation and nervous agony for the weeks ahead. 4. It’s Tuesday. Life is good. I like you. So many reasons to rejoice! Find yours and toast with this APPLE CIDER SPARKLER cocktail. I’d love to know: What are you celebrating this week? Comment below and CHEERS! Cheers to you. This Apple Cider Sparkler cocktail is a reason to celebrate unto itself! I have two favorite ways to make this Apple Cider Sparkler cocktail: One is with Irish Whiskey. I use 2Gingers, which is distributed in the Twin Cities (my current bottle was a kickin’ wedding gift), but the widely-sold Jameson is a solid choice. My other preferred variation, which I think is especially good in the fall, is to make this cocktail with bourbon. I adore smooth Bulleit, but feel free experiment. Diet ginger ale and sugar-free apple cider make for a super-skinny cocktail that is high on the flavor but low on guilt. Sip freely! Apple cider, gingerale, and bourbon or whiskey make a refreshing fall cocktail. A delicious low calorie, skinny cocktail option. If creating a cinnamon-sugar rim: Mix together cinnamon and sugar in a shallow dish large enough for the mouth of your glass. Wet rim of glass with apple slice or a damp paper towel. Dip in cinnamon-sugar mixture to coat edge. Pour whiskey or bourbon in bottom of glass. Stir in apple cider drink mix. Fill glass with ice. Pour ginger ale on top and garnish with apple slice and cinnamon stick, if desired. Cheers! Hope you enjoy. It’s one of my new favorites. Thanks so much for stopping by and taking time to comment. Happy to have you here and to connect!